Ever since the start of the company over 30 years ago customer focus has been a guiding star for SiTek. With the focus on custom designed products, continuous improvements within the Production area have been a natural ingredient in order to implement and adjust different process steps to best fit the customers request on the product. To further increase the pace in this continuous improvement work the Production Department have introduced a program for Lean Production as an accelerator. 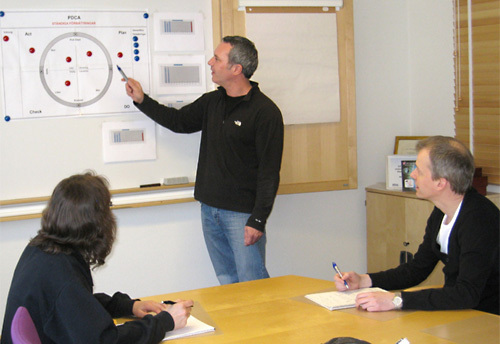 To learn more about Lean, a so called “Lean Game” was carried out. It simulates an enterprise and clearly shows how Lean principals and methods work. The purpose of the Game is also to show that Lean is all about working smarter – not running faster! SiTeks production flow was analyzed to look for value, waste and areas to improve. A Value Stream Map was constituted and the flow of a typical SiTek product was then reviewed by walking the process from order to delivery, step by step. A Continues Improvement group was formed to bring up ideas of improvements which were added to a PDCA (plan, do, check and act) board. New actions where taken to improve and secure routines to increase and maintain the high quality in each process step. It is with great satisfaction SiTek already can see the fruit of the Lean introduction and the applicability of this tool in the challenge of an ever increasing demand for more complex products without renouncing the short lead times.